History: These are all names of what we widely call “passion fruit,” notice the space which dictates spelling in the US and the UK. This fruit grows on a vine, and is native to Argentina, Brazil, and Paraguay. It grows well in warmer climates and now exists in Asia, Oceania, Africa, and North America (CA, FL). The scientific name is Passiflora edulis . 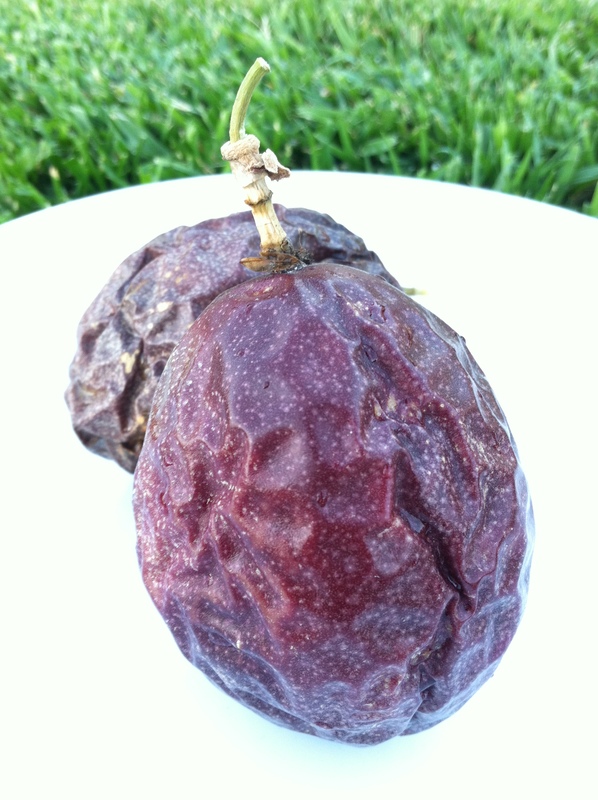 As noticed below, this fruit is oval in shape with a thick outer layer that is about a centimeter thick when still raw which gradually thins down as the fruit nears maturity. 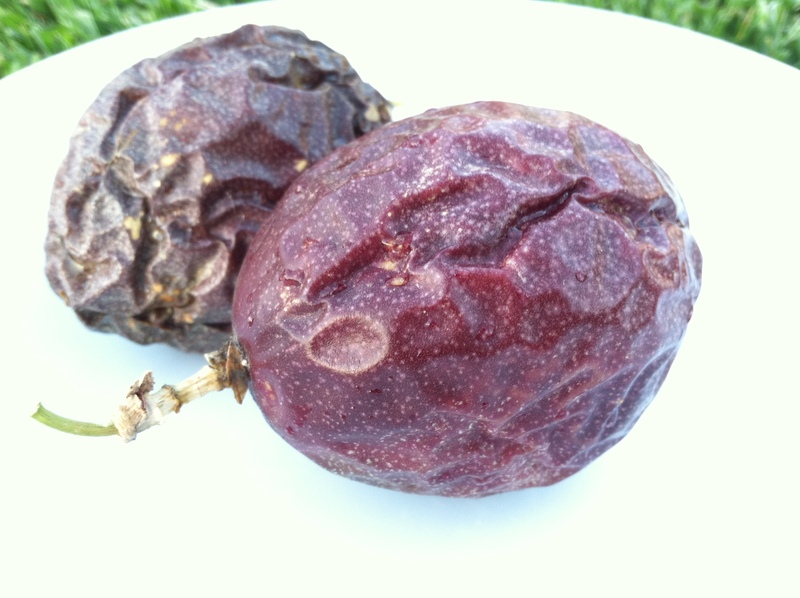 It is optimal to pick when the passion fruit has wrinkled a bit, which signifies how ripe it is. This year, the passion fruit has developed ahead of schedule which is why the color is still not a deep purple. 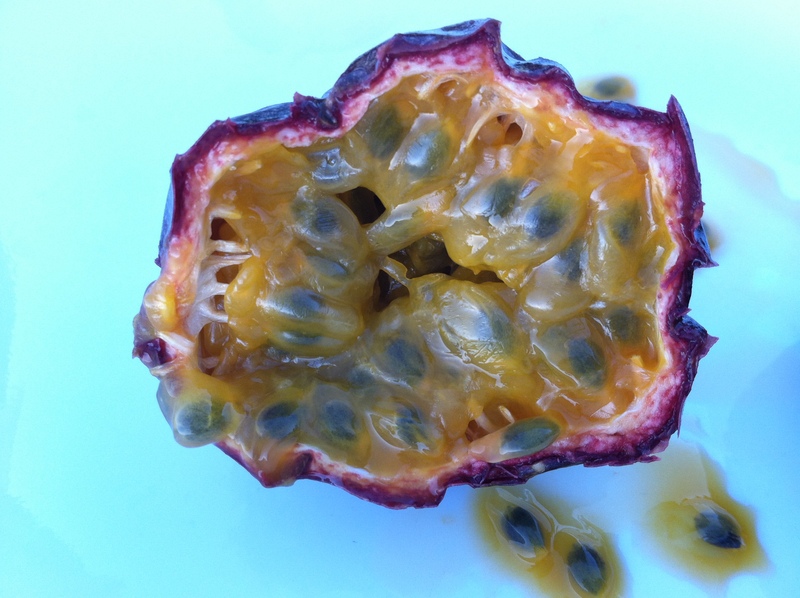 The inside of a passion fruit comprises of a bulb that contains an edible seed inside, connected to the wall of the fruit. Think cantaloupe seeds that are tied to the fruit with a thin string. 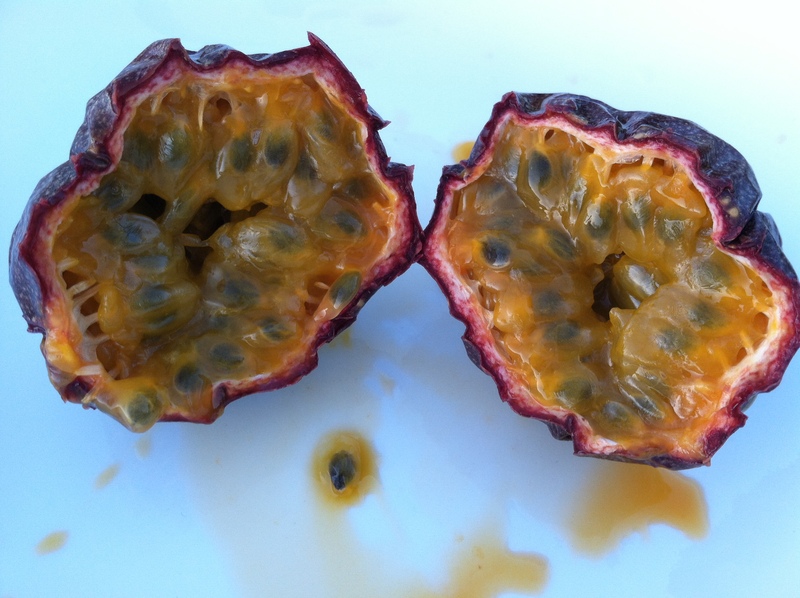 Passion fruits are rarely eaten as a fruit by itself in America. It is more commonly used as a liquid enhancer in drinks (tea) or as a flavor enhancer in desserts (mousse). How to eat? : Half a decade ago when I first ate passion fruit, I would strain the juice out and throw the seeds away. Although most don’t eat passion fruit seeds, it isn’t detrimental to your health if you eat the seeds. In fact, I recently learned and have experimented eating the seeds along with the pulp and juice. So, slice your passion fruit in half and using a spoon, delicately start carving away at the edges to remove the white thin string that ties the bulb to the wall. The wall of the maracuja is strong (unlike say, an orange) so don’t be shy and carve away. Taste: Imagine the clashing sharp tanginess followed by an exotic sweetness that leaves you smacking your lips and squinting your eyes. The aftertaste, though is what many will describe as a combination of lemon, pineapple, and guava. Makes sense right? A lemon is sour and pineapples are sweet but if cut open a day early will leave you with the tanginess described above. Similar to a guava, consuming the seed does not alter the taste of the maracuja. The seed is not too hard and when you chew it, will pop, excreting no new flavors. Texture: The juice of the passion fruit is not thick. The “meat” the resides and encases the seed is a bit slimy and slippery. Chewing away at the seeds will allow you to eat this part of the fruit without using a strainer. Here is a freshly cut passion fruit with honey on top! 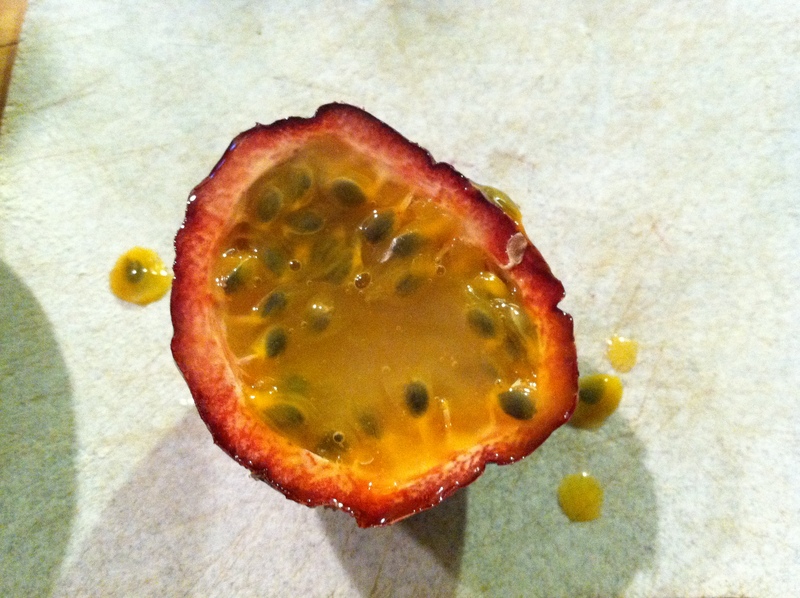 Have you had passion fruit before and what do you use it for in your cooking? never had it with honey before – looks tasty!